I’ve noticed as that being a parent has added a healthy dose of the word “awry” to my vocabulary. As in best laid plans and how they tend to go, especially when you have hatchlings. Add to that pets or livestock of any kind, and well, you never really know what’s going to happen. My plans this weekend were to do a quick post recapping our semi-vacation. Semi, because the husband was attending a conference, so I was solo parenting most of the time and he was conferencing most of the time. But we did manage to squeeze some fun, sun and sand in before coming back with a sick, feverish three-year-old (awry), and those pics are coming next. Right now I bring you the monkey wrench in our weekend. Hatchling #1 came running into the house Saturday to tell us that one of our hens (a Barred Rock, for any of you chicken enthusiasts out there) was bleeding. We went out to investigate and found that not only was she bleeding, she was bleeding pretty badly. Not spurting or gushing, but a constant ooze from her soft belly. So we put on our chicken shirts (i.e., shirts we can ruin), a pair of gloves, prepared a chicken bath so we could clean her off and see what we were doing, and I took off my chicken stylist hat in exchange for my Chicken Doctor hat. And we went to work. To disgusting, dry-heaving work. Awry. “There it is, I found the bleeder, I can’t make it stop! Clamp! Stat! !” Bock, bock, cluck, cluck. We tried everything we could think of and even some things we’d have never thunk, like flour. (Yes, that was a suggestion on many chicken forums. Talk about feeling strange about putting flour on a live chicken.) I tore up Google with my searches on what to do. I got as up to speed on chicken anatomy as much as I could and learned that chickens have one orifice for all bodily functions. And it’s called a vent. Very important to know that. Whatever you do, don’t EVER use search terms like “hen bleeding” along with any other mammalian-like term for vent. Not that you’ll ever need to, but just trust me. Other tactics we tried were to put pressure on it. We ruined the husband’s styptic pencil. I put a band-aid on it. They don’t stick so well to feathers. But it looked like we had at least slowed the bleeding, so after that taking up our entire post-nap afternoon (nap for H#2 and #3, not the husband and me), we decided to see how she did through the night. The husband got out of his bloody clothes and got ready to go play golf. Oh, did I forget to mention it was his birthday weekend? And this was the first chance he was getting to go and play golf since we moved to the golf capital of the South? Poor guy — not what he had in mind. Awry. I washed my hands until they were raw. Ick. I talked to the kids and we had a long conversation about Bumblebee (the Barred Rock) and how she was hurt really bad and we probably couldn’t fix her. The kids were sad, but took it pretty well. We went on about our day, making birthday brownies, eating lunch, taking naps, getting ready to go swimming with cousins, and I went one last time to go check on Bumblebee. She immediately ran out to see me, but then I realized it wasn’t her. 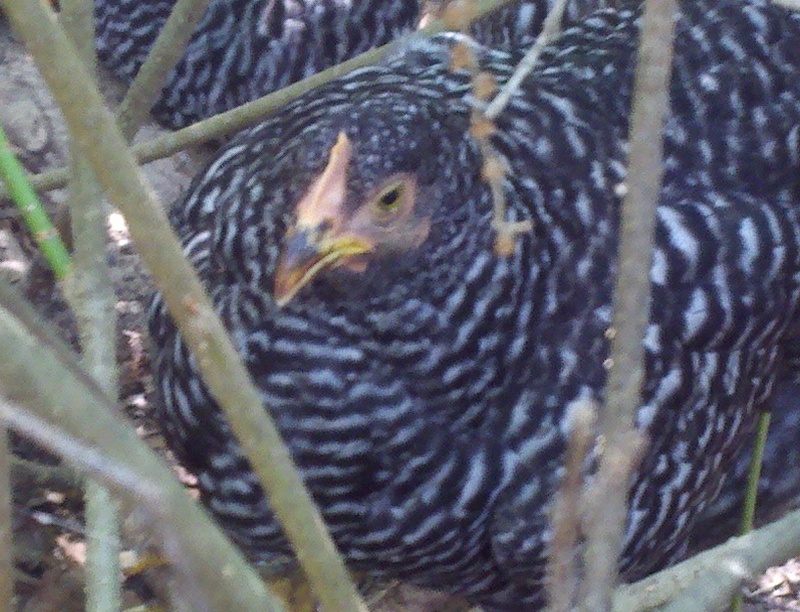 It was one of the other Barred Rocks (Queenie or Chasey) because this one didn’t have blood on her. I searched and I searched but couldn’t find her so I was getting ready to give up when I saw her drinking the Chickenade (electrolyte water) I made for her. And she wasn’t bleeding. Something we’d done had worked. Or more likely, it had finally stopped on its own. Whatever the reason, she seemed fine. We left to go swimming with a glimmer of hope (yes I realize it’s a chicken we’re talking about) and we came back to find her running around, eating, scratching and doing all things chickens do. A birthday miracle! Somebody asked the husband when we thought she was a goner, why he didn’t just put her out of her misery. His answer was something like, “Because there was a small chance that she could bounce back. We thought our rooster wasn’t going to last through the pecking incidents that left him bald either, but he did.” Ahhh, the sweet glimmer of hope through all the awry-ness the world throws at us. I just got back inside from checking on Bumblebee. She’s bleeding again and now, despite spending the last 45 minutes recreating the exact same steps that worked yesterday, I can’t get it to stop. Awry. The word that keeps me on my toes. All of us really. Because no matter what we have going on, there’s always something else. For everyone. The legendary Art Linkletter used to always say, “Life is what happens to you while you’re busy making other plans.” I’m not sure if that was his original quote, because there are many who lay clam to it, but it’s really true. It’s the glimmers of hope that keep you going. Here’s hoping a little hope finds you in the middle of your best-laid plans. You, know, just to get you through the awry-ness of life. Bravo, Young Farmers! Farming is full of tough decisions and minor miracles…that’s why we always have hope. You’re welcome. Thanks for the shout out.